It’s the time of the year when Gillette, Schick, and other producers of men’s razors likely experience a drop in revenue. In November, men throughout the world reduce or abandon altogether their shaving to raise awareness and money for men’s health issues, specifically prostate cancer and male mental health initiatives. 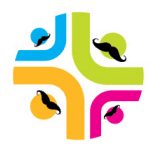 In support of this worthy cause, Blatant Media has formed a Movember team. In less than ten years, this important initiative has raised more than $850,000 million. We’re now in the second week of November so all of us—with the exception of Mo Sista Danielle Roberts—are at the stage where our faces could be used to scour dirty pots and pans. Animals and small children run away when we enter a room. Needless to say, no one dares kiss us. In three weeks, we all, (with the exception of Danielle), hope to resemble Brad Pitt and Johnny Depp . You’ll be the judges. We’ll be posting before and after photos of team members at the end of the month. Until then, we hope you’ll support this great cause.